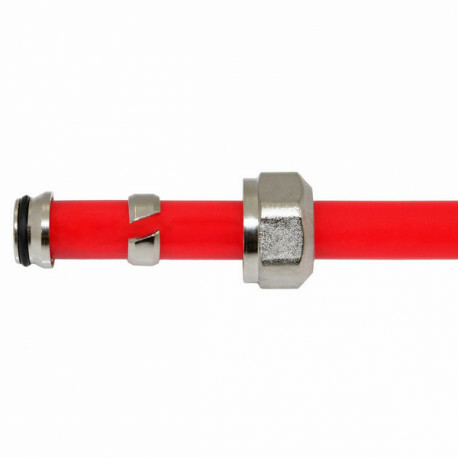 3/8" PEX Compression adapters are used to connect 3/8" PEX tubing to the radiant heat manifold's outlets. PEX insert is crimp style and is compatible with all types of 3/8" PEX tubing (A, B or C). These adapters do not require use of any PEX tools or rings - simply use a crescent wrench or adjustable pliers to tighten the nut over the manifold outlet. Adapters are free with any SSM/BSM manifold purchase. 1/2" PEX adapters are included by default - if you need 3/8" adapters or any other combination of available adapter sizes instead, leave a comment on the checkout page - no additional purchase is required.